This heating system has literally changed our lives! Living in an old cold villa, radiators were the obvious choice to heat our home and KE KELIT made it happen! The radiators are quality in look and design, and visitors to our home comment on them often. We love the heat that they produce and the fact that they are automatic. It is an easy to use system that can be tailored to your or the individual room requirements. The team at KE KELIT were great before and during the installation and have been there for any questions after the fact. We happily recommend KE KELIT’s products and service. We thoroughly enjoyed working with KE KELIT on the renovation of our home. The team at KE KELIT were knowledgeable and accommodating, and they talked us through the system and backed up their proposal with good clear science on the sizing and layout of the radiators, resulting in a comprehensive and efficient running system. "We have never had such a warm house"
Homeowner Pippa and Paul from Carrington Plumbing talked to us about their experiences with central heating and the team at KE KELIT Climate Control. Central heating is a heating system that heats your home from one central point and then circulates that heat to the rooms within your home. KE KELIT Climate Control specialises in “Hydronic Central Heating.” This is when a central heat source such as a Boiler or hot water heat pump heats water in a central location. The heated water is then circulated through a network of pipes to underfloor heating or radiators. Standard efficiency gas boilers can no longer be installed in Europe. However, they are still heavily promoted in New Zealand because of the perceived price advantage - but it’s a false economy. Energy efficient condensing boilers can reduce operating costs by up to 35% compared to standard efficiency heat sources. So, any increase in capital cost is very easily offset by reduced operating costs. At KE KELIT, we only design systems with the highest quality energy efficient boilers from European supplier Viessmann. Perfectly suited for New Zealand’s unpredictable weather, Radiators provide high performance, rapid heat-up times and healthy, radiant heat without forcing dust allergens around your home. KE KELIT offer a diverse and stylish range of radiators and heated towel rails from European supplier Vogel & Noot. In recent years Underfloor Heating has been widely acknowledged as one of the most effective and efficient methods of heating. Underfloor heating’s superior efficiency means that your running costs will be significantly lowered so the ongoing savings on your energy bills quickly outweigh the initial outlay. Underfloor Heating is also extremely discrete. With nothing showing above floor level, it does not interfere with either your living space or your décor. This leaves you free to make the most of every square foot of your floor and wall space without compromising comfort. 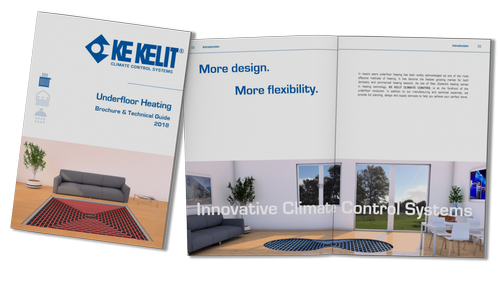 KE KELIT Climate Control’s Underfloor heating systems ensure even heat distribution throughout your home, eliminating cold spots and draughts.